NEW YORK -- Mets reliever Jenrry Mejia became the first player to receive a lifetime ban under Major League Baseball's drug agreement after testing positMets reliever Jenrry Mejia became the first player to receive a lifetime ban under Major League Baseball's drug agreement after testing positive for a performance-enhancing substance for the third time. ive for a performance-enhancing substance for the third time. The commissioner's office said Friday that Mejia tested positive for the anabolic steroid Boldenone, which athletes have used to increase muscle mass and once was popular for use in horse racing. The 26-year-old right-hander was the Mets' closer in 2014, then was suspended for 80 games last April 11 following a positive test for Stanozolol, a drug popular among bodybuilders. At the time, he said, "I can honestly say I have no idea how a banned substance ended up in my system." Mejia returned July 12, appeared in seven games for New York, then was banned for 162 games on July 28 after a positive test for Stanozolol and Boldenone. "I think not surprisingly there's a tremendous amount of disappointment, I think to some extent, anger, to some extent, amazement that this could happen so soon after a previous suspension was completed," Mets general manager Sandy Alderson said then. "This is the consequence of making bad choices." The Mets said Friday they "were deeply disappointed." The Major League Baseball Players Association declined comment, and a spokesman for Mejia's agents said the pitcher had no comment. Under pressure from Congress to toughen their drug program, major league players and teams agreed in November 2005 that a third positive test for PEDs would result in a lifetime ban. His 162-game suspension had matched the longest under the big league program, a year-long ban served by the Yankees' Alex Rodriguez in 2014 that originally was 211 games before an arbitrator reduced it. Mejia may apply one year from now to baseball Commissioner Rob Manfred for reinstatement, and Manfred at his discretion has the power to let Mejia back in baseball - but no earlier than for the 2018 season. If an application is made and denied, Mejia could ask baseball's arbitrator to end the ban, claiming the penalty is without "just cause." The arbitrator cannot reduce the ban to less than two years. Outfielder Josh Hamilton, then in the minor leagues, was suspended several times for drugs of abuse from 2003-05 but was allowed to return each time. During a time when there was not a drug agreement, Steve Howe was suspended for life by Commissioner Fay Vincent in 1992 after the pitcher's seventh drug- or alcohol-related incident. Arbitrator George Nicolau said doctors concluded Howe suffered from Attention Deficit Hyperactive Disorder and cut the suspension to time served, which was 119 days. A Dominican signed by the Mets in 2007, Mejia reached the major leagues in 2010 and became their closer in 2014, when he had 28 saves in 31 chances. He is 9-14 with a 3.68 ERA in 18 starts and 95 relief appearances. 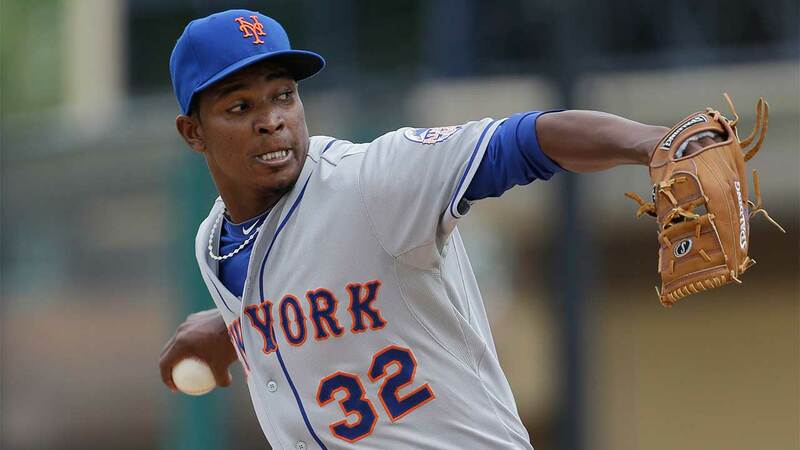 Mejia began last year as the Mets' closer, but couldn't get loose while warming up on opening day at Washington and went on the disabled list with elbow inflammation. Because of the suspensions, Mejia received just $496,311 of his $2,595,000 salary last year. He will receive none of his $2.47 million salary this year. In Mejia's absence, Jeurys Familia became New York's closer, and the Mets went on to reach the World Series for the first time since 2000. New York lost the World Series to Kansas City in five games.